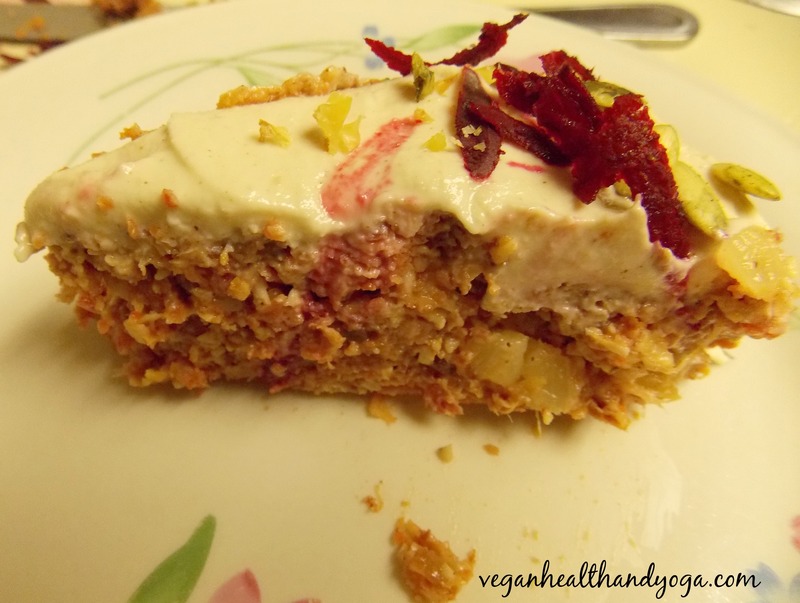 After experimenting with some really amazing raw recipes online, I’ve come to a new belief: you CAN have your cake and eat it too! 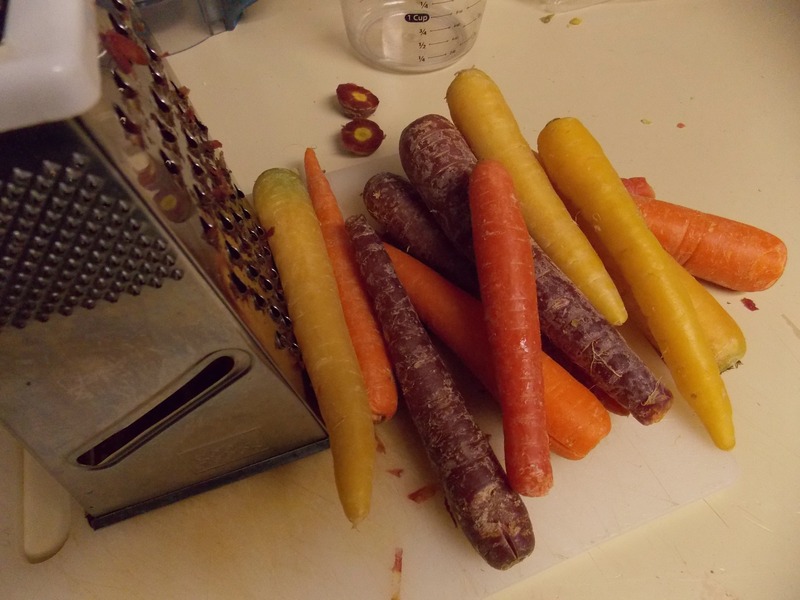 For the last week, I craved carrot cake but wanted to try making it RAW. Most of the recipes I saw online used way too much coconut oil and honey so I decided to create my own version to cut back on the fat and sugar by using pineapple, which gave it a unique dimension of tropical sweetness. The only ingredient I used that isn’t raw is the vegan greek yogurt. I added it to boost the nutrients in the frosting and to get that extra creaminess. 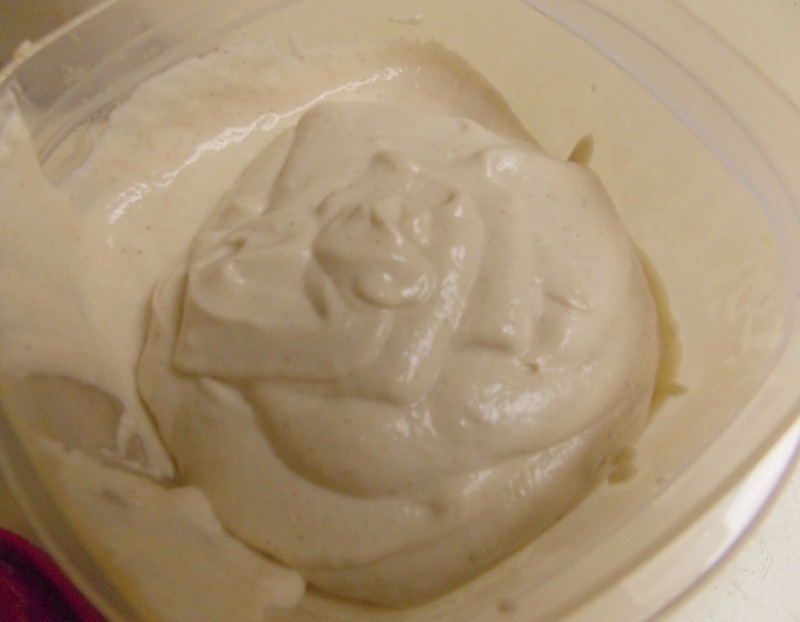 I’ve made cashew frosting before but I’ve always cut back on the coconut oil so it ends up turning out a little runny. You can leave out the yogurt if you choose and simply use an extra tablespoon of coconut oil instead to keep the frosting fully raw. So here is the yummy result! 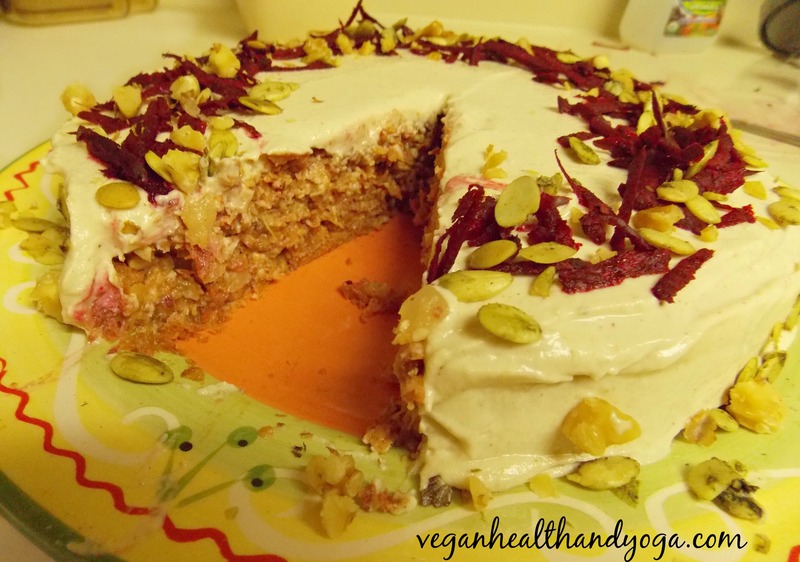 Be prepared to wow your tastebuds with this super healthy cake because its made with NO DAIRY, NO SUGAR, NO GLUTEN, NO SOY and best of all, NO GUILT! Start by soaking your cashews in unsweetened coconut water so that by the time you start your making your frosting, they will have soaked for minimum 30 minutes. You can also just use water. 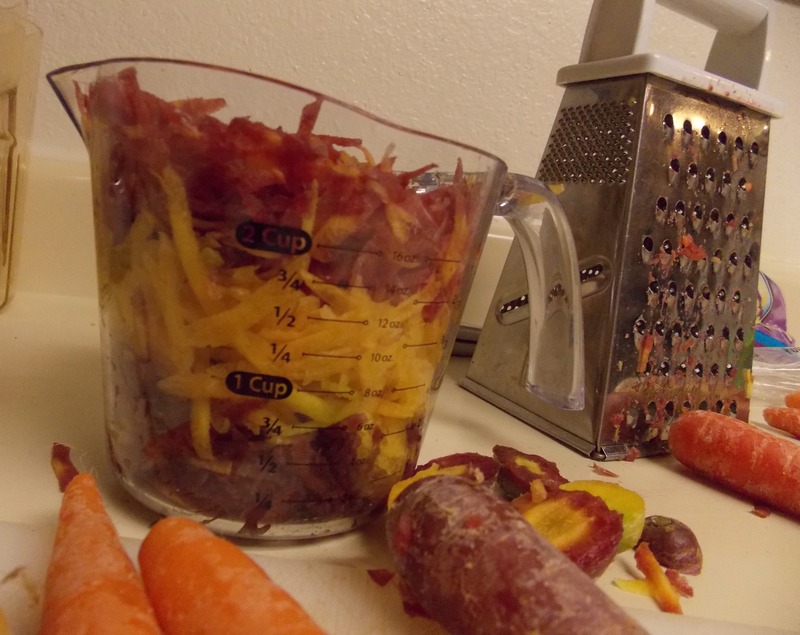 Shred 4 cups worth of rainbow carrots. Add all cake ingredients into your blender but with only 1/2 cup of the crushed pineapple. Pulse 10 seconds at a time so you can push down ingredients with a wooden spoon. This will ensure all ingredients get blended evenly. You want to aim for a MINCED batter, not a smoothie batter. You can squeeze in more lemon juice to get things flowing but not too much. Line and mold wax paper onto a 1×6 inch cake pan. Fill raw cake batter half way and push down with your hands to fill in edges. 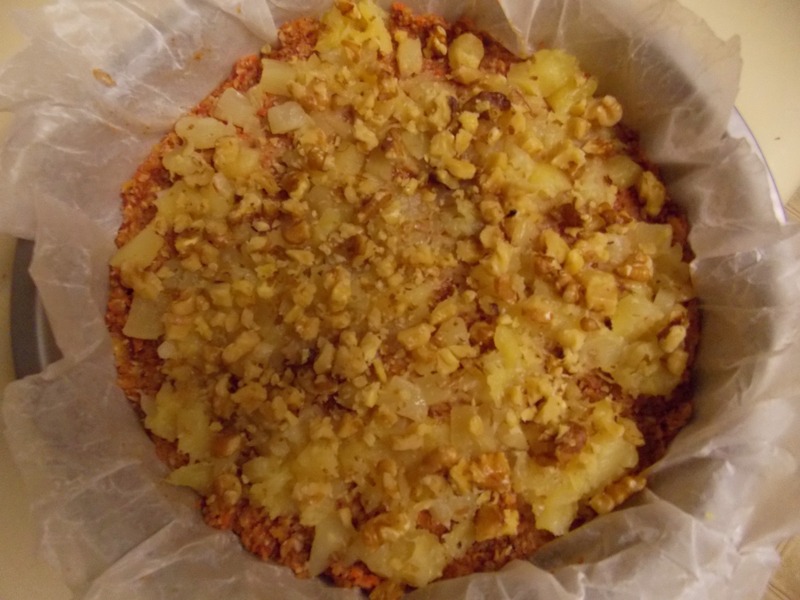 Next, spread the other 1/2 cup crushed pineapple with some chopped walnuts on top of the cake batter. This will give your cake a little sweet and nutty crunch surprise! Finish pushing down the remaining cake batter as a third layer. 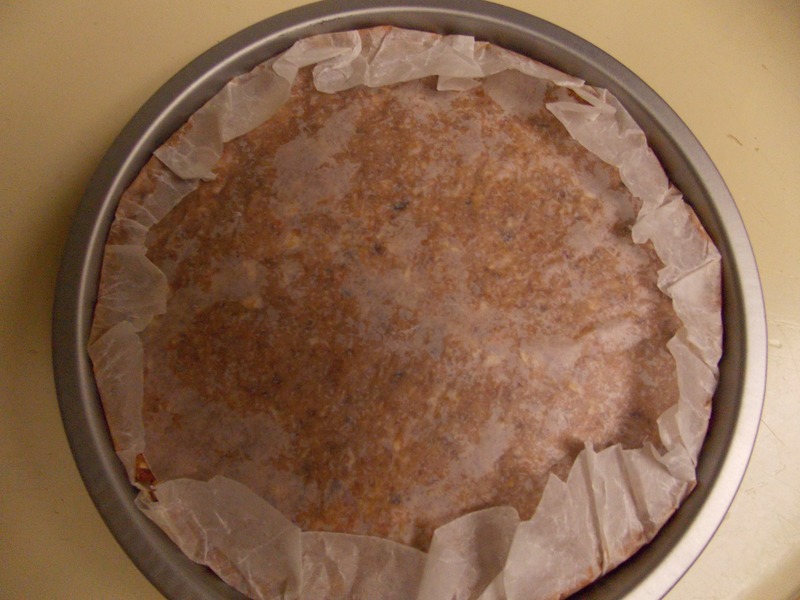 Use wax paper to cover the cake and place in the freezer for about 3 hours to set. Drain the cashews and add them into a blender. Add remaining ingredients and blend for 5-7 minutes. Stop frequently to shake or stir mixture down. 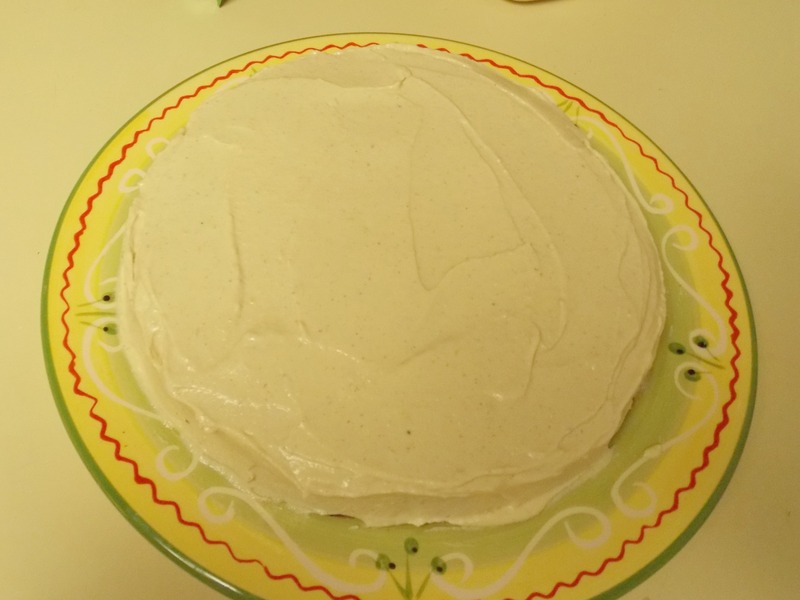 **Adding unsweetened coconut milk yogurt helps to make the frosting creamier without adding more fat. Most vegan frostings on the web call for a lot of coconut oil which helps keep the frosting from becoming runny but the downside is too much fat. Have more lemon and pineapple juice ready to add in while blending. Add only 1 tablespoon at a time so you don’t end up with a runny frosting. This will assist in getting all the cashews blended evenly. Scrape out the frosting into a container and chill in the refrigerator with a lid. The frosting will thicken up very nicely by the time the cake is ready. 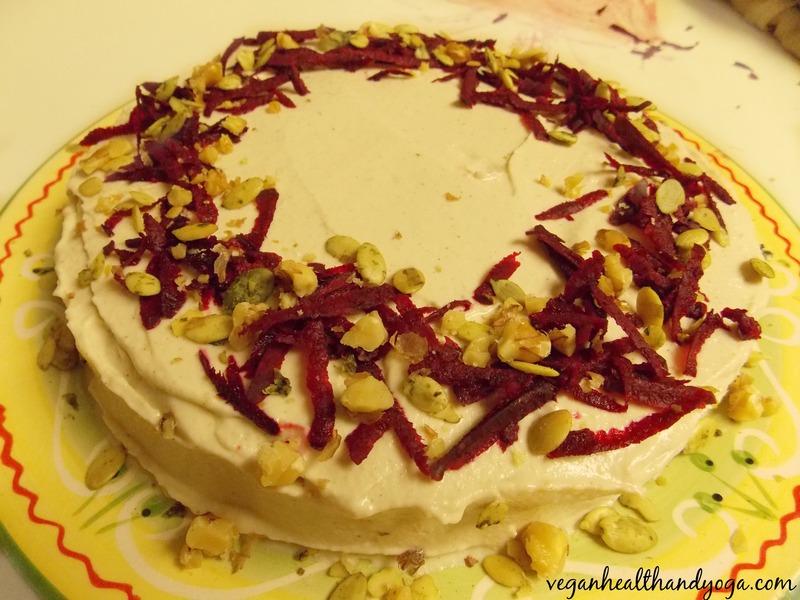 This entry was posted in Raw Desserts and tagged carrot cake, dairy free, gluten free, rainbow carrots, raw, raw vegan cake, soy free, sugar free. Bookmark the permalink.